He just wouldn't stay away"
An innovative experimental animated film from 1949, created by scratching and painting directly on a strip of film, with mood and movement synchronized to jazz music by the Oscar Peterson Trio. It's not Fantasia, but it's an innovative, surprisingly watchable technique well executed by director/animator Norman McLaren. A wonderful, painterly black-and-white short created using a "pin-screen" apparatus, where individual pins are pushed and pulled to create areas of light and dark. It's a fascinating technique from a visual perspective; even more impressive, it doesn't distract from the story about an artist who discovers a nightmare world after stepping into his pastoral creation. A cute, deliberately "cartoonish" piece about log-rolling Canadian river workers, set to an old folk waltz with entertaining lyrics. A long-time festival favorite, this animated musical tale of old Mr. Johnson and the "cat who wouldn't leave his home" achieves a Warner Brothers quality as the battle between man and feline escalates. The song is insanely catchy, and the joke is built carefully, exquisitely timed with a knockout punchline. Great stuff. An entertaining, loosely animated short about a concert pianist who can't bring himself to practice for an upcoming recital. He noodles around, wasting time in just about every conceivable way, and the humor grows primarily from the character's recognizable humanity, though there are a few great little gags. A warm, funny reminiscence by French-Canadian Roch Carrier, remembering the mortifying day when his mother replaced his worn-out but much-beloved Montreal Canadiens hockey sweater with a garment featuring the despised Toronto Maple Leafs. Gently paced and visually inventive under Sheldon Cohen's direction, this brilliant short film will appeal to anyone who was ever young and "uncool." Caroline Leaf's unique painting-on-glass style illustrates Mordecai Richler's touching, naturalistically humorous story of a young man and the chaos his family encounters while his grandmother lies on her deathbed. The smearing, morphing artwork somehow illuminates the underlying reality more than live action ever could. Stirring, richly emotional work. Norman McLaren continued his experimentation with this manipulated live-action work, focusing on body form and motion. Two ballet dancers perform in carefully backlit black-and-white, merging, freezing, and trailing echoes of themselves in a visually fascinating montage. A computer-animated short from 1989, created to honor the fortieth anniversary of the National Film Board of Canada. The geometrically simple tale of three odd characters working to arrange a celebratory cake is primitive and "floaty" by today's standards, but the animation has an appealing rubbery quality, utilizing more stretch-and-squash than was typical for CGI at the time, and some dazzling particle effects seem considerably ahead of their time. Image Transfer Review: The program is presented in its original made-for-television 1.33:1 full-frame format, drawn from a broadcast-quality videotape master. As far as I know, all of these films were created in the standard Academy ratio, and no content has been lost to cropping. Aside from some red/blue aliasing on fine black-and-white details in Pas de Deux and occasional 30-fps video pulldown artifacts, the image looks surprisingly clean and crisp. Reds are slightly overemphasized, but the transfer is generally free of edge enhancement, fuzziness and the other defects common to video-mastered DVDs. A new transfer from the original film sources would have been preferable, but I found very little to complain about here. Audio Transfer Review: The DVD features a true Dolby Digital 1.0 monophonic soundtrack, rendered cleanly from sources that vary from audibly dated to simple but active. While most of these films were produced in the pre-digital days, the soundtracks are generally lively and well-edited, with effective music and atmospherics. Frequency range is competent and the digital transfer is solid, though somehow it seems odd that this Canadian material lacks a French soundtrack or even subtitles. Extras Review: The disc features no real extras, just 11 chapter stops, one for each of the featured shorts plus two for the introduction and end credits. 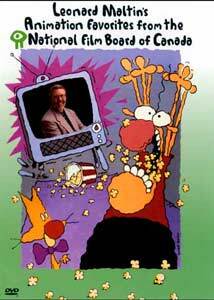 In this case, the lack of DVD supplements is mitigated by Maltin's in-program introductions for each short, which contain some biographical and production information. Chaptering is intelligently handled, leading directly to the beginning of each short, with Maltin's intros treated as part of the previous chapter. Whatever your personal opinion of Leonard Maltin, his taste in animation remains impeccable, and Leonard Maltin's Animation Favorites from the National Film Board of Canada contains nine of the finest short animated films ever made in the Great White North. Image's DVD features a decent transfer, and Maltin as host provides some informative pseudo-supplementary content. Every DVD animation collection should have a few discs like this on hand. Highly recommended.